Rebecca Hoover at protest against Congresswoman Michelle Bachmann and Congressman Ron Paul whose policies help keep those with MS without health insurance. Photograph taken at the University of Minnesota, Sept. 25, 2009. Research shows that stress can make multiple sclerosis (MS) worse, and there is almost nothing in the United States that is more stressful than not having health insurance coverage. For this reason alone, reform in health care is needed in the United States. Health care needs to be a right. Those who have MS should not have to worry about not receiving health care when needed, and the new so-called health insurance reform law does not go nearly as far as it should. Those who live in the USA know that decade after decade conservatives, big corporations and Republicans in the United States have refused to provide affordable health insurance for the many individuals who desperately need insurance. Those who have MS and many others are hurt by this callousness and suffer needlessly. Some die. Every year in the United States, 45,000 individuals die because they lack health insurance. This is a moral disgrace and must change. I pledge to work and fight for universal health care in the United States and I encourage others to join me in this work. I will not give up until access to health care is a right for all citizens. No one should be denied health care because they lack money or insurance. Health care must be available to all, affordable for all, and be of high quality. This is the great moral imperative of our time. In Minnesota, where I live, concerned citizens are banding together in hopes of changing the law in Minnesota so that Minnesota becomes a single-payer state and has a wonderful system similar to the Canadian system. This system is highly popular with Canadians for good reason: it provides high quality and affordable care to all Canadians. How does it do this? By eliminating insurance companies that merely take about 18 percent of the health care dollar for doing nothing but shuffling paperwork, denying claims and coverage, and rationing the remedies for suffering and pain. I encourage everyone to continue to work with me knowing that we have right on our side. No great improvement has ever happened overnight but if we continue to work we can make change happen. I encourage everyone to join me in the ongoing struggle for real health care reform in the USA. The new bill offers improvements but it does not go far enough. Many with MS are likely to be left in desperate straits. Rebecca Hoover at a health care vigil on Sept. 2, 2009. The event had a wonderful turnout of dedicated and concerned citiizens. 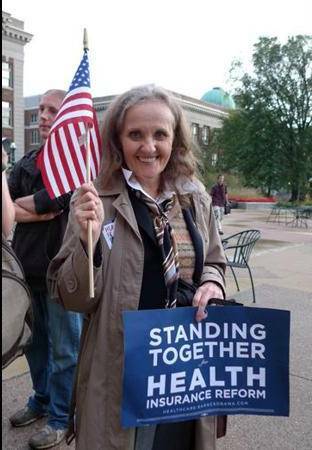 Another picture of Rebecca Hoover at Sept. 2, 2009 vigil in Minneapolis. 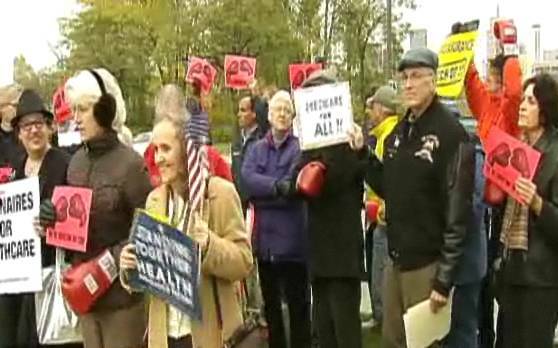 Rebecca Hoover, in tan coat, at rally at office of Senator Al Franken, Oct. 14, 2009. I totally agree with you Rebecca. I used to subscribe to the website of Doctor Mercola, as over the last year I have found many of his alternative health articles useful and informative. But I recently unsubscribed in disagreement with his views on health care. I live in Australia and have not found that it is any erosion of my civil liberties to have (in addition incidentally to my choice of a private health fund) a fair and universal safety blanket of health care on which anyone, including myself, can rely. I am glad I live in Australia in that regard. Best wishes, KB .. ps: my MS drug Copaxone is free on public health and costs me $30 a month for the chemist (drugstore) to keep refrigerated. I also have learned much from Dr. Mercola, but certainly won’t subscribe now. We in Scotland have the most MS in the world and excellent all nation healthcare.